It’s as if your best friend had suddenly died and nobody would tell you how. Heart attack? Car crash? Murder? This time the afflicted isn’t a person, but a startup called WhipCar. The idea of WhipCar… Rent your car out for the odd day or weekend to your neighbour to cover its vast cost. 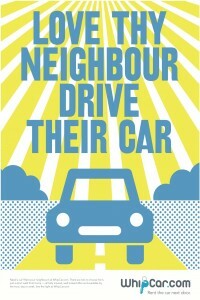 Or, if you don’t own a car, rent your neighbour’s car more cheaply and easily than a hire car. It’s a genius idea, the Internet enabling us all to share our capital resources. The Economist had a whole piece just last week about that, including WhipCar. There’s a meaningless statistic used a lot in Silicon Valley – 9 out of 10 startups fail. That said, for startups that haven’t reached product/market fit, it’s a statistic that often feels true. My world is littered with the corpses, or more often comatose bodies, of competitors/partners (it’s hard to tell the difference) that I once let myself get emotionally excited about. So why are they in their death throws? This is what they say. Meh! Barriers! I’ll see your barrier, and raise it one community desperate for new ideas like WhipCar to succeed. There are four things that could have happened. In each case, I’d love a little bit more from Vinay Gupta, the charismatic, amiable, tenacious founder of WhipCar (don’t confuse him with the other Vinay Gupta, inventor of the Hexayurt). 1. Not enough customers, well tell us then! There’s no reason not to if you’re about to shut down the company. Open up your marketing figures for us all to see. Does one side of the market need a cultural change? Write it up! At the very least, anyone else planning a similar startup will have much better information to come up with a way through it. At best, somebody right now will work out how to help WhipCar get an initial viable market – with a Spread Firefox-like crowd marketing campaign, or a new demographic you never dreamed of. 2. Fundamentally not enough revenue for the business model to be viable… Again, open up your books! Why not, you’re about to destroy the company! Explain to your customers why there isn’t enough revenue. Perhaps you can increase prices with their support, or they can help with cost savings in a way you haven’t imagined. If not, at least it’s documented for business schools and future entrepreneurs what doesn’t work. 3. Lack of capital. Here I mean fundamentally lack of capital – growth and revenue figures which if you plot on a graph, end up with a viable business. It just has negative cash for a while. This is the most unbelievably easy one – open up all your books, and do a crowd funding round. If you don’t think one is legal in the UK, I know a lawyer who can help, or you can go to the US where crowdfunding is now legal. 4. Destroyed by other forces. Failure of execution, tell us so you can get the missing skills. Failure because competitors beat you, tell us so we know what future initiatives are up against. Failure by corruption, oh please please tell us please. Failure because of the law – we’ll run a campaign to fix the law. All the above might sound a bit mad. Is it really the job of the customers of a company to help it exist? Oh yes, oh yes it is. Bringing a new product to a new market is an incredibly difficult thing to do. WhipCar got really far – it managed to largely fix the insurance difficulty in its model, and had at least a reasonable number of paying customers. There are lots of people who want WhipCar, or something like it, to succeed. It’s ideological. We want it to be easier to not have to own a car, and easier to share use of that carbon-intensive to make capital resource that is a car. There are literally a zillion geeks who would help. We’re pretty worried about climate change. Why? I’m not sure, but I think it is because nerds are particularly able to read the reports with sufficient technical knowledge, combined with dispassion. Please, a well written blog post from Vinay… Barely all I’d need to do would be to retweet it. Or if that didn’t work, go and tell the awesome community at Cleanweb UK what help was needed. Let’s sort it out. Or if not, at least learn. Hope you manage to fix their business model, want to see this work! Surely they can then extend to caravans, trailers etc? I like this blog post. I have been looking for reasons why this model has failed and am unfortunately unable to find the reasons. Vinay is an alumni of the business school I went to and I reached out to him through our alumni network but havent heard back from him. Maybe he’s busy planning his next start up? The answer is simple – didn’t concentrate on building a community and gaining real traction in one area. So many P2P startups will make that mistake if they don’t watch it due to pressure from investors etc. What they should have done is build a really liquid local community on one area and then expanded slowly, not simply gone national. That doesn’t work for hyper-local P2P businesses unless you have loads of money. Would love to find out more about some aspects of Whipcar’s business model, particularly insurance.. a local group in SE London I’m involved with wanted to start a nonprofit Whipcar-like service, but we couldn’t find a sensible insurance product or an insurer willing to negotiate (it’s cheaper to hire a fully insured car than take out 3rd party cover by the day or week). I think Adam’s pretty much on the money really – to be sustainable nationally, they’d need to be a £5M/year business after COGS (= fees to car owners & insurance); given that no hirer will spend more than about £1000/year (as buying a car is more cost-effective at that point) and many will spend far less, and that their margin is probably only 10%, they’d have needed far more hirers than they probably had. They may have done better to launch in a hotspot area where being semi-carfree is a common lifestyle choice but people want something more cost-effective than ZipCar; saturate the area with marketing instead of being a nationwide service that people haven’t heard of & so probably don’t trust — and trust is all-important when you’re thinking about letting some total stranger use your car. Hi Angus- I am invovled with Selce- South East London Community Energy. Would love to heard about how far your group got if you are still about? Just Côme across this. I’m looking to start a peer to peer car hire in the uk, it’s very successful in France. Didn’t réalise that the UK already had one, so was a little dismayed but only to find out it has closed down. Now either that means i should not continue With this venture or continue and avoid the mistakes they made, whatever they were. Anu – I wouldn’t be put off, you should hustle to find Vinay who ran WhipCar to get lessons learnt off him. James Smith (@floppy on Twitter) can probably put you in touch. He runs CleanWeb UK, which you should definitely join and go along to! We are sorry as well. We are in the process of starting a global peer to peer car rental service across Europe. Starting in Denmark, England and Germany. We have just launched our sign up page and we are in the final process of closing a deal with a global insurance company. So please take a look and sign up to stay informed. Vinay is now a trustee of Carplus “the UK’s pioneering transport NGO supporting the development of affordable, accessible and low-carbon shared mobility” which sounds ace. Also, he’s still involved in London Business Council, I assume as an alumni/mentor. It failed because if you were 5 minutes late then the car owner took all your money (even for a whole weekends rent) as they would claim they had to leave and therefore couldn’t hand over the keys. I had a horrible stressful experience with Whipcar! My housemate used it to hire my car-a nice way to let him use my car without risking my no claims/insurance etc. He had a minor bump and MY insurer got dragged in, my personal insurance was very nearly made void and cancelled (implications at the time and for future I’m sure you can imagine). My insurer Admiral said I had breeched contracted by renting car evdn though through Whipcar with separate insurance so not a risk to them. They were insistent the scheme would void any customers insurance. I managed to sort this with them by confirming I would never rent again with Whipcar etc and the claim did get processed via whipcars insurance. But, the accident is still to this day listed in accident bureau in my name and it impacted ony premiums for several years. Whipcar were informed and basically just told me Admiral (one of the biggest insurers in UK were wrong). No help getting accident out of my name, mo warning to others customers that their personal insurance coukd be invalidated with impact for years to come. I wrote to Which as they had reviewed the scheme as excellent. I still don’t understand how so many Hugh profile reciews, including Which and national papers didn’t pick up this issue or why insurers didn’t respond with warnings. If the CEO fancies actually getting the accident out of my name now he is in London Business Council I’d be grateful! So anyone doing peer to peer car lending be very careful and explicitly check with your insurer!